A spongy substance that could be mistaken for packing material has the nanotechnology world buzzing. University of Central Florida Associate Professor Lei Zhai and postdoctoral associate Jianhua Zou have engineered the world’s lightest carbon material in such a way that it could be used to detect pollutants and toxic substances, improve robotic surgery techniques and store energy more efficiently. Zhai’s team worked with UCF professors Saiful Khondaker, Sudipta Seal and Quanfang Chen to create multiwalled carbon nanotubes (MWCNT) aerogel. Carbon nanotubes are so small that thousands fit on a single strand of human hair. And using the nanotubes instead of silica (major material in sand), the foundation for traditional aerogel, increases the materials’ practical use. For the first time, even the tiniest pressure change can be detected and tracked. Strips of MWCNT aerogel could be used in robotic fingers and hands to make them super sensitive and give them the ability to distinguish between holding a power saw or a scalpel – a distinction necessary for use in surgery. Because the nanotubes have a large surface area , great amounts of energy could be stored in the aerogel, increasing the capacity of lithium batteries or supercapacitors used to store energy generated from renewable resources such as wind and the sun. Combining the larger surface area and improved electrical conductivity is also important in developing sensors that can detect toxins capable of invading the food or water supply. And the same technique can be used to develop equipment capable of detecting even trace amounts of explosives. “This has many potential applications and could really open up new areas to explore that we haven’t even imagined yet,” Zhai said. A report detailing Zhai’s work appears in the journal ACS Nano. Check out a video explaining his work on YouTube. 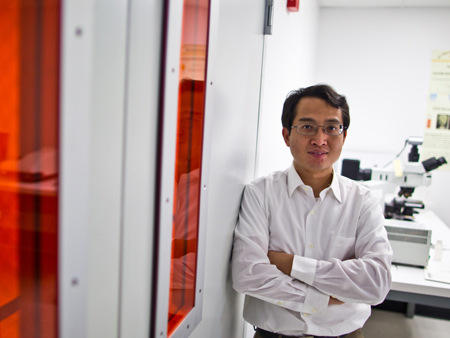 Zhai joined UCF in 2005 after he completed his post-doctoral work at the Massachusetts Institute of Technology. He has a master’s degree in Chemistry from East Tennessee State University and a Ph.D. in Chemistry from Carnegie Mellon University. Zhai has written dozens of peer-reviewed articles, has obtained six patents and is a frequent speaker at national and international conferences. He is the recipient of National Science Foundation CAREER Award. How does one invest in this new discovery?